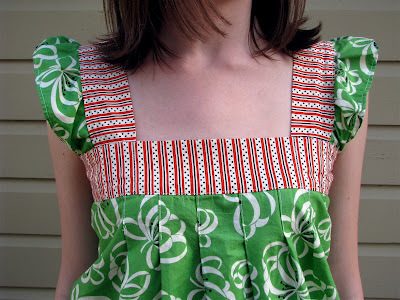 Spring Top Week is starting early with a Spring Top Tutorial over at Sew Mama Sew!!! I’ve been working on this for a few weeks but didn’t want to give away any surprises, but now it’s up and running so I’m very excited to share it with all of you. Just in time for you last-minute sewers who wanted to make a spring top but didn’t have a pattern!!! Go check it out; you may recognize the green version from last summer’s top week. I’d also like to thank my svelte and very non-pregant seester Kricket (in the pics above) for helping model the tops, just to show all you “normal” people out there that it looks great even without a six-month baby bump. But I did try hard to make sure that it would work for all sizes (including maternity) so give it a try and let me know what you think! I love it! Thanks so much, Rae! That shirt is awesome and also being pregnant, it will work fantastically!! I can’t wait to pick out fabric for it. Thank you so much for sharing! Saw you on Sew Mama – awesome tutorial! VERY cute! Love the green top. This is very thoughtful of you, i was just thinking that i have to start working on mine after searching high and low for a pattern. How lovely to have it on great site like Sew Mama Sew. I love the fact that you took step by step pics you make it look so easy. I better get cracking and start working on it. I love it! I will have to try and make one. And I still need to work on my shirt (aka START!) for Spring Top week. This really looks fab, Rae. I want to make it…now! I can’t wait to make this!!! Thank you so much!!!! This is such an adaptable pattern that I think I’ll make one for my daughter after I finish my top for Spring Top Week. Thanks for a great tutorial! Very pretty, I love it and my 16 yo daughter wants me to make one for her right away!! I’m wearing mine right now! I saw your tutorial while I was at work, got home, and made it. LOVE it– and it actually fits (I’m a size 0-2, most patterns don’t fit). Shaping the sides was the best part. Thank you so much– I’ll blog about it in the morning. I’m in love with this and need to drive to a store right away to buy some fabric…. Thanks sooo much for sharing this tutorial !!! I have being looking for a pattern for these kind of tops, want to make one for my dd and one for me. Love it !!! Wore a store bought one last year than is no longer wearable for going out ;-D .
Thanks Again for sharing this tutorial !!! And Congratulations on your pregnancy !!! Ok that bird fabric is freaking fantastic!! I love the shirt and hopefully I’ll get a chance to make one soon! just found your blog via Sew Mama Sew! I love this top so much that I went out this weekend to get fabric to make 2! I’m sure I’ll post about them this week and let you know how mine turn out-the tutorial looks great! Thanks for sharing, I’m so looking forward to sewing this week! So cute! I’ll have to get started on a stash before I get pregnant. Saw this on SMS. Thanks for sharing! And congrats on the baby belly! Wow, this is so cool! Thank you Rae! I’m pregnant too so this pattern is super awesome for me! I am loving this! I am going to make it a little longer so that I can wear it as a dress. I am pretty sure that my little sis is going to want one too. Oooh and I have just the thrifted sheet that will do perfectly. Thanks! I Loooove this top! I just came up with an idea for one I am going to make this Fall even though I don’t have the fabric yet! 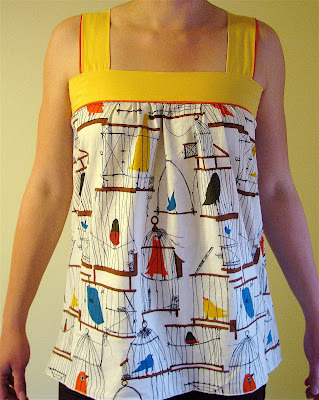 What an adorable top…I must make one like the birdcage fabric. Can you share the source? Thanks!! I made your top. It was my first garment ever. I love that top, it looks like it might even cover my 5 babies belly and middle aged spread (not admitting to any more). I might try it. Love that this is measurement based so can make some for my girls! Thanks! I made a small version this top a few years ago for my little girl. She so desperately wanted a train shirt for a girl. A bit of train fabric and a solid color + one afternoon = one happy little girl. She wore it til there was no way it would fit any longer. Thanks for the tutorial, it’s definitely one of the most loved items I’ve ever made.